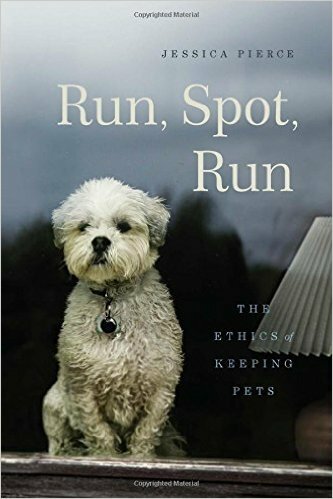 In Run, Spot, Run, author Jessica Pierce devotes a chapter to “Pet and Planet;” the environmental impacts of owning pets. This chapter considers a few areas: the effects of environmental toxins on our pets, the environmental impacts of pet-food production, and the effects our pets themselves have on the environment. In just a few pages, she really had me thinking hard. The first one’s relatively easy. I filter our tap water, don’t use horrible chemicals to clean my tiny apartment, don’t buy Jana and Cali those vinyl toys that last about 5 minutes and leach terrible phthalates (whatever they are; all I know is that they’re bad) into our pets’ bodies. Basically, I protect Jana and Cali from environmental pollution as well as I can — and at least as well as I protect myself. The third one is a bit tougher: how pets affect the environment. I often think that future civilizations, having unearthed millions of those knotted plastic poop baggies, will think that dogs were in charge (they’ll be right …). Pierce also mentions all the stuff we buy our pets. Yep, three cushy dog beds in my minuscule two-dog home. Big basket of toys. At least six leashes. Cali’s cowgirl hat. Stuff galore. I can rationalize the environmental impact of my pets: I don’t go overboard; I don’t generally buy a lot of stuff. All of our life choices have some impact on the environment — and they’re not always bad. I walk a lot more because I have dogs, spend more time outside. I pick up trash so my dogs won’t eat it; I pick up other dogs’ poop at the park. People have children despite their impact on the environment (and they require a lot more stuff than dogs). Getting the typical American child from birth through potty training results in a pretty big pile of plastic diapers. While I think that pet owners and petless people alike should do what’s feasible to minimize the damage they cause to the environment, I am not convinced that it’s a convincing argument against having dogs. It’s that middle one, the pet-food production argument, where I have the most trouble. I don’t eat meat, mostly because I dislike everything about the food-animal industry. I think that being vegan is the best choice, though I am not there yet. Cali and Jana are not vegetarians. I buy high-quality dog foods for them and make sure that all their food is sourced and produced in the USA (or, at minimum, from trustworthy sources that are not in China). But … meat and seafood consumption are key contributors to global warming, pollution, and over-fishing. Ironically, those of us who seek top-quality ingredients for our pets exacerbate the problem. Cheap pet foods use a lot of the waste material from the food industry. The standards for what can be used in animal feed are distressingly and disgustingly low. But by insisting on good quality ingredients, I fuel the same factory farming industry that I have opted (mostly) out of for myself. One suggestion Pierce offers is that people buy sustainable meat and fish for their pets and decrease their own consumption proportionally. That argument has some merit, and I’ve made great progress … on the “reducing own consumption” part. If the goal of an ethics book is to get people thinking about tough questions, Pierce’s book is already a huge success, and I am only halfway through it. I doubt that anything she says will convince me not to have dogs. But I don’t think that’s her goal. Getting readers thinking will lead to changes in their behavior. Cali and Jana are already looking forward to lovingly home-cooked meals of organic, pasture-raised meat, sustainable seafood, and local organic veggies … in their dreams. Yeah, factory farming is why we raise our own animals for meat, but I realize not everyone can do that. I’d make my own dog food if we could raise enough meat for the dogs too.